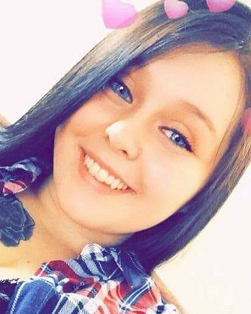 KAYLA ANN MARIE TAYLOR, age 20, of Jeffersonville, passed away on Saturday, February 9, 2019 at her home. She was born on April 7, 1998 in London, Ohio to Chris Taylor and Amie Jones. She was a 2016 graduate of Fairfield High School. Kayla had a huge heart that was filled with a love for her children. Kayla was preceded in death by her maternal grandfather, Tom Jones and paternal grandparents, June and Hershel Taylor. Survivors include parents, step-father, Lloyd Hupp; her children, Kymani Ford and Meleah Ford; siblings, Tyler, Aden, Braden, Ryan Taylor and step-sister Kylie Hupp; grandparents, Julianne (Rick) Robinson, Janice Hyer and Mark Taylor. Also surviving are several aunts, uncles, cousins, and a host of friends. The funeral service will be held on Friday, February 15, 2019 at 1:00 p.m. at the Grace Community Church with Pastor Jay Lucas officiating with burial to follow at the Washington Cemetery. Friends may call at the church on Friday from 11:00 a.m. until the time of the service.